Festival "Coachella Style" Glitter is all the rage and is a lovely way to celebrate body positivity. We use 100% cosmetic grade glitter in an aloe-based gel for a glitter glow that won't clog your pores or make you break out. Festival glitter can be done anywhere on the body including hair and face. Some of our glitter is even bio-glitter, meaning it decomposes naturally and will not harm our environment. Not all of our glitter is bio-glitter as the aloe base can make it break down over time... We try to do our part to save the planet! Festival glitter will wash off easily with soap and water. As with all of Vermont Face and Body temporary body art, Joy uses the best materials available on the market. Due to allergies and sensitivities, no costs are spared finding the absolute best supplies which are FDA compliant cosmetic grade quality. Joy's glitter tattoos are made in the U.S.A. and all of her pixie dust and glitter is cosmetic grade and safe for use on the skin. The glitter tattoos are water resistant through swimming and bathing for up to a week (with normal wear, up to about seven days). NEVER use craft-glitter on the body! Metal glitter can scratch the cornea if it accidentally gets into the eye. Cosmetic grade glitter is made of a soft material similar to contact lenses and will "blink out" if it accidentally gets in the eye. If this happens, flush with water or eye drops. We only use cosmetic grade glitters. Glitters are effective on any skin tone :) Some of our glitters are even blacklight/UV reactive and glow under blacklight! AMAZING! Free hand or stencil designs? We do booth! The benefit of hiring a professional artist is that your imagination is the limit! Any design you can dream of can be hand painted on in a one of a kind custom tattoo. 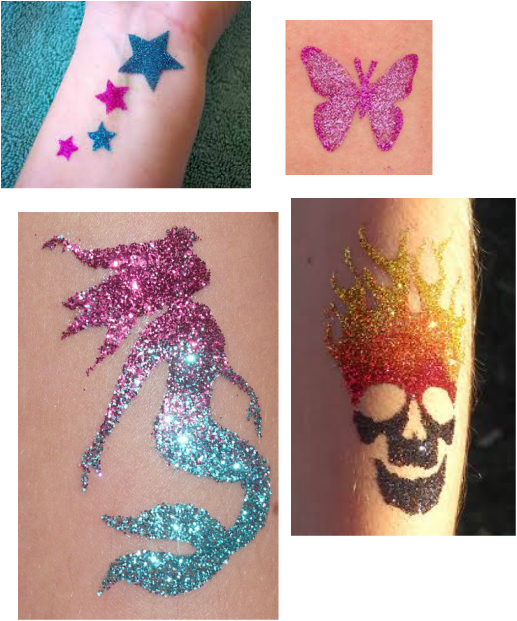 Glitter tattoos - First, the skin is cleansed with alcohol, then either freehand drawn or an adhesive stencil is placed directly onto the skin to make the design in cosmetic glue. With your choice of glitter color, these tattoos will remain waterproof, sweat-proof, and sparkling for about a week! Due to the cosmetic glue, we don't apply glitter tattoos on the face. Festival Glitter - We apply the glitter with a base of aloe (no cosmetic glue needed) and can modify designs with bling (attached with cosmetic glue) or just stick to the glitter. This can be done anywhere on the body, including hair and face. Festival glitter washes off easily with soap and water; first try to wipe the bulk of the glitter away from your eyes before washing in entirety. If any does happen to get into your eyes, it will not harm you and will "blink" out easily. See our Service Agreement for details on booking your event.